TORONTO -- Ontario's new premier has taken a step in his plan to dismantle the province's cap-and-trade system, a move some observers say leaves businesses involved in the program grappling with uncertainty. In a statement released Tuesday, Doug Ford said he has revoked the regulation that outlines the carbon pricing system and his government will officially begin winding down all green programs funded through it this week. Ford said the province will nonetheless honour contracts and orders that have already been signed for projects funded by cap and trade, such as energy efficient insulation and window retrofits. Some rebates for energy-efficient renovations that were financed through cap-and-trade revenues -- such as the GreenON rebate program -- were already being phased out before Ford officially took office last week. The premier said the government will decide on a case-by-case basis whether some initiatives previously funded by the program will be paid for using tax base revenue. Those decisions will take into account his overall plan for the province and the results of an upcoming value-for-money audit of government spending, he said. The Progressive Conservative leader, who was officially sworn in as premier Friday, had promised that cancelling cap and trade would be his first order of business. In order to scrap the program, the premier must first amend or rescind the legislation that governs it, said Keith Brooks, program director for the advocacy group Environmental Defence. That law sets climate change targets and earmarks cap-and-trade revenues for green initiatives, among other things, he said. The government also has to formally notify its partners in the Western Climate Initiative that it is withdrawing from the cap-and-trade system, Brooks said. The agreement signed by the province said the government would endeavour to give a year's notice before pulling out but it's unclear whether Ford plans to do so, he said. "We know that the premier... promised to get rid of cap and trade and we understand he's moving quickly to fulfil that promise but I think that there's some problems here because there's some questions that haven't been answered," he said. Ontario companies have bought close to $3 billion in permits under the cap-and-trade system and need to know whether they will be compensated for those permits, Brooks said, noting some have suggested the province should offer a full refund. More details are also needed on how the green initiatives funded by cap and trade will be closed so that both consumers and businesses involved in delivering those services can make decisions and plans, he said. "I think that there's a lot of businesses, quite frankly, that still have a lot of questions, I'm sure, about how this is all going to proceed," he said. "People need the details on exactly when this is going to be wound down and if there are any programs that are going to persist, we also need to know what those are, because otherwise the manufacturers are going maybe on a rollercoaster ride," he said. The NDP and the Greens have said Ford's rush to pull out of the cap-and-trade system could stick taxpayers with the tab for billions in legal fees, penalties and other costs. 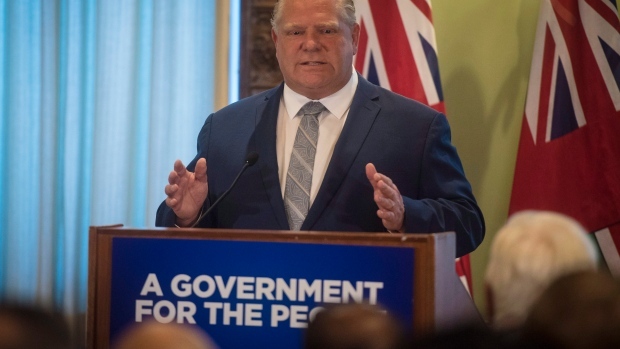 Ford's office did not immediately respond to a request for comment Tuesday but the premier said in the statement that he believes scrapping cap and trade will put money back in Ontarians' pockets. "I promised that the party with taxpayers' dollars was over and that this would include scrapping the cap-and-trade carbon tax slush fund. Today we are keeping that promise," he said. The government's website does not list contact information for the newly appointed minister of the environment or any other cabinet members. A spokesman for Ford said the ministers' offices are not currently staffed and requests for comment should go to the premier's office.